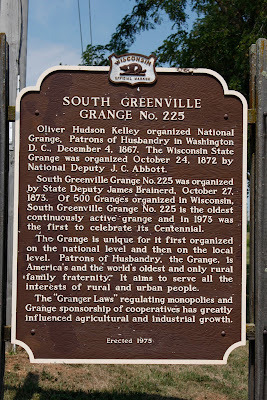 Oliver Hudson Kelley organized National Grange, Patrons of Husbandry in Washington D.C., December 4, 1867. 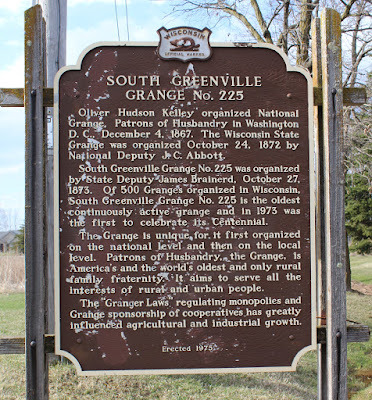 The Wisconsin State Grange was organized October 24, 1872 by National Deputy J. C. Abbott. South Greenville Grange No. 225 was organized by State Deputy James Brainerd, October 27, 1873. 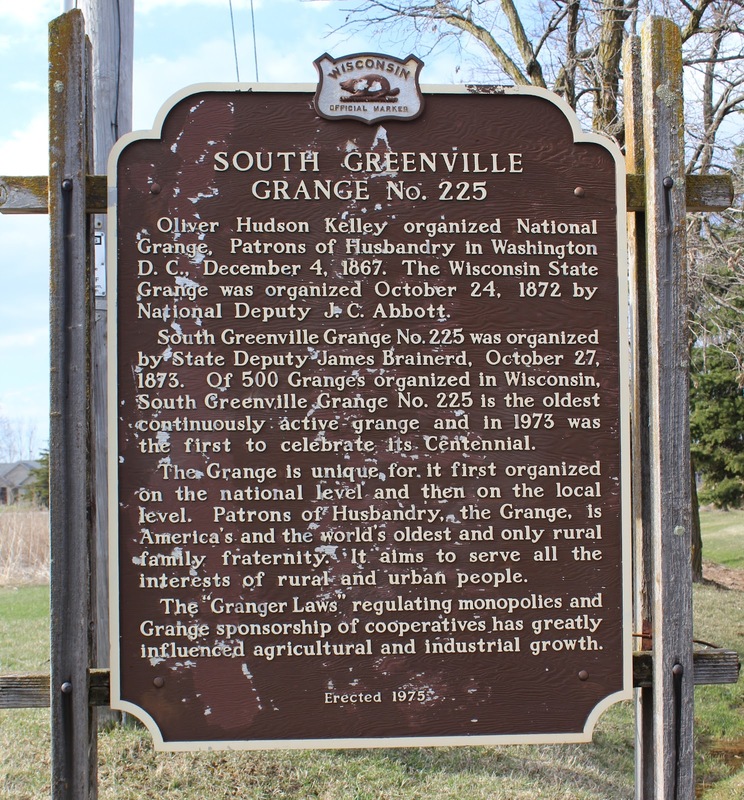 Of 500 Granges organized in Wisconsin, South Greenville Grange No. 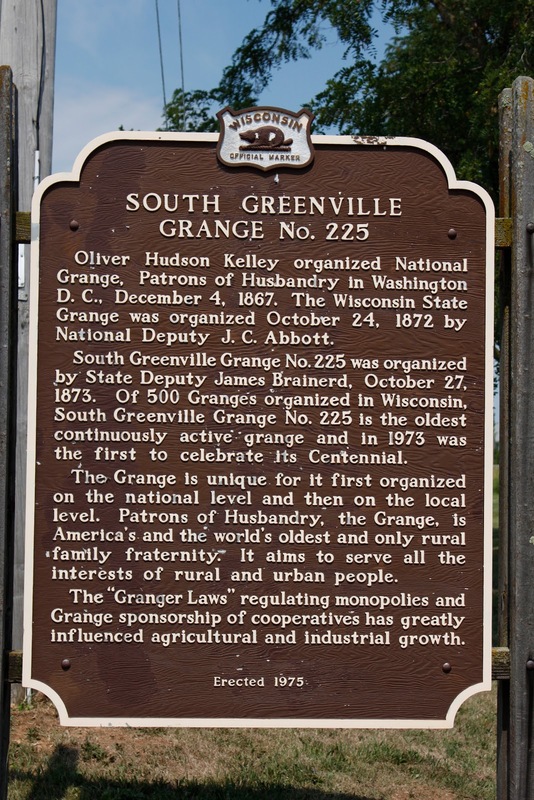 225 is the oldest continuously active grange and in 1973 was the first to celebrate its Centennial. The Grange is unique for it first organized on the national level and then on the local level. Patrons of Husbandry, the Grange, is America's and the world's oldest and only rural family fraternity. It aims to serve all the interests of rural and urban peo­ple. The “Granger Laws” regulating monopolies and Grange sponsorship of cooper­atives has greatly influenced agricultural and industrial growth. The marker is located on westbound Winnebago Drive / County Highway BB, just east of its intersection with Municipal Drive / Wisconsin Highway 76, Neenah, Wisconsin 54956. The east entrance to the building. South Greenville Grange No. 225 in the background.